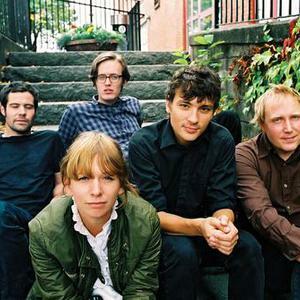 Love Is All is a five-piece indie rock band from Gothenburg, Sweden, formed in 2005 and composed of Josephine Olausson (vocals, keyboard), Johan Lindwall (bass), Markus G?rsch (drums), Fredrik Eriksson (saxophone), and Nicholaus Sparding (guitar/vocals). Olausson, Sparding, and G?rsch had previously been members of Girlfriendo. The trio promptly regrouped after that band's demise and added Lindwall, who had recorded in a side project with Olausson and Sparding called Cat Skills. They finally added the missing piece with saxophone player Fredrik Eriksson. While earning many rave reviews from the blogging community for their blend of art punk and indie rock, the band released several singles, one of which made single of the week in NME. The singles were collected on the debut LP Nine Times That Same Song, released by New York-based What's Your Rupture? in late 2005. After much touring through 2006 and 2007, Eriksson left the band and Love Is All continued on as a quartet. A Hundred Things Keep Me Up at Night and the remix album Love Is All Mixed Up arrived in 2008, along with Eriksson's replacement ?ke Str?mer (saxophone, keyboards). They are currently signed to the New York-based indie label What's Your Rupture?.